This film is one of four different films based on the play of the same name by Lottie Blair Parker. 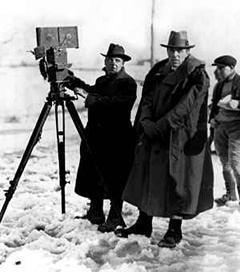 Parker was an inexperienced writer from whom Griffith bought the rights to the film. This was the third silent film, and was later followed by a 1935 “talkie” starring Henry Fonda. It was one of Griffith’s most commercially successful films, and it was also even more expensive than Birth of a Nation (1915). It was subtitled: A Simple Story of Plain People. The film stars Lillian Gish (Anna Moore) and Richard Barthelmess (David Bartlett) who also played Cheng Huan in Broken Blossoms and also was nominated for the first academy award for best actor. Anna and her mother are impoverished and in need of money so Anna goes to the city in search of money from her wealthy cousin. Her cousin and sisters reject Anna at a ball they are having, until their obscure extremely wealthy aunt gives Anna nice clothes. However, at the ball Anna catches the eye of Lennox Sanderson who is a known womanizer. Near the Sanderson family estate is Bartlett Village which is owned by Squire Butler and his attractive well spoken young farmer’s son named David. They live out in the country. Meanwhile, Lennox lures Anna to his house saying that his relative will meet them there, but when she arrives there are only two of them. He tries to grab Anna but she gets angry until he says he wants to marry her. She is immediately smitten and accepts. They are then married in a sham wedding staged by Lennox with some friends acting as proper religious people. He pays them off. Soon, they begin their honeymoon where Anna gets pregnant, and later Lennox admits that the wedding was a sham, leaving Anna sad, and alone, and with a child. After Anna’s mother dies, she wanders away to hide her shame and she gives birth to her baby that gets sick and dies. She then goes to find work and winds up on Bartlett’s farm where David quickly falls in love with her. Soon rumors get out that Anna had an illegitimate child and Bartlett sends Anna out into a snowstorm during his rage. This all occurs during an awkward dinner in which Lennox is visiting and making passes at Kate, another girl at the house to whom David was initially betrothed from a young age. David follows Anna out into the storm and rescues her from a floating piece of ice before a waterfall. In the final scenes Lennox apologizes to Anna and offers to marry her, but Anna rejects him over David. Together Anna and David get married, along with two other couples from the film. The scenes at the end of the film were highly dangerous and Lillian Gish’s hand was damaged for years from being in the freezing water. However, the ice pieces were made of wood. 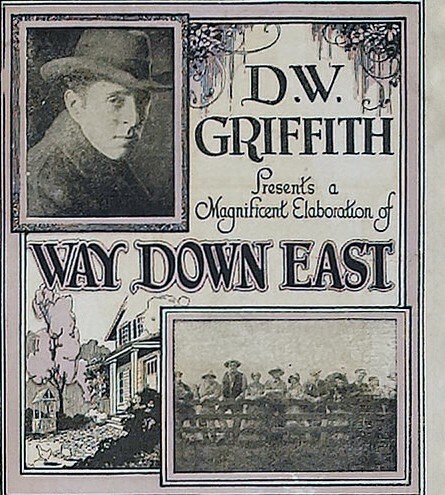 Way Down East is a far more sentimental film than many of D.W. Griffith’s other works. Once again, the leading star Lillian Gish delivers an excellent performance with several memorable moments. However, the film lacks an inspiring quality of excellence that can be found in Griffith’s Birth of a Nation and Broken Blossoms.